We were dismantling the old shed roof on our block yesterday evening, banging away at massive pieces of dangerously loose planks of wood attached to perilously sharp sheets of rusting corro, when we stopped to take stock and look around. It’s not often we go into the woods next to the big billabong along the creek, for one thing it’s pretty overgrown with trailing vines and tangled branches, and for another it’s a haven for mosquitoes. Also it’s saltwater crocodile territory. Today was no different, but as I stood back from the shed I heard the distinctive whistle of a radjah shelduck and then something very white caught my eye through the trees. Living in the bush I’m on constant visual and aural alert for the next wildlife encounter: eyes and ears scanning for the new and unusual. I’m always hopeful that the stick lying on the grass is a snake, or that the branch is swaying from a bird of prey landing. The flash of white through the trees was one of those signals. A few steps into the woods and I could see it was something out of the ordinary. Something larger than usual. I once saw a little egret in the small billabong and I’m always hopeful it’ll come back. This time it was a great egret, stalking on the far side of the big billabong on the bank where the lily-filled pond meets the meandering creek. I could see the outline of its neck so long against the shapely curves of its body, so white against the mud-brown bank and aqua-green water. 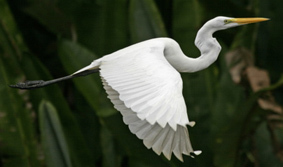 Great egrets are twice the size of little egrets and can stand up to a metre tall. The joy of seeing such a creature in close proximity may well have been twice the joy of seeing the little egret. Who can measure a thing like that? I called to my partner in demolition and we crept under the vines and over the branches, trying to crunch as quietly as possible on the ankle deep fallen leaves. Mind you our cacophanous banging and clattering hadn’t disturbed it so why should the sound of crunching leaves? Approaching the brow of the billabong we could see another white shape at the edge of the water, a duck this time, the radjah shelduck I’d heard. It was still whistling quietly. Again its clean white and black body stood out sharply against the muted tones of the bank. This was even better. The ducks are quite common, in fact the local flock of maturing ducklings had kept me awake last night with their socialising in the mahogany next to the house. 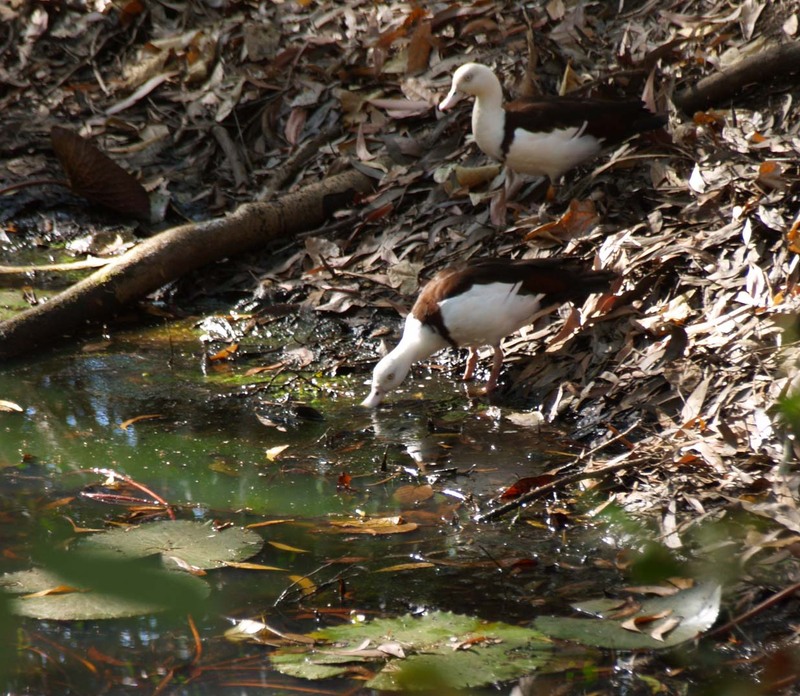 But to see both the egret and duck at the water’s edge really added to the sense of vitality around the billabong. The water was completely still, the creek having all but stopped flowing, but it was deep and the white lilies were an attractive mask over the brackish water. All thoughts about the shed were forgotten now as getting a better sight of the birds drew me in. The egret was making its way up and down the creek, turning its yellow bill upstream and down searching for fish or crustaceans. There must be plenty to eat in there it seems, for such a large bird to bother. Then as I got closer to the water’s edge another black and white shape caught my eye. This time it was a little pied cormorant perching on a branch suspended over the middle of the billabong. This is going to sound really over the top, maybe because it seemed that way to me at the time, but I started to make my way around the water’s edge to get a closer look at the cormorant and of course startled it and lost it to the bush. 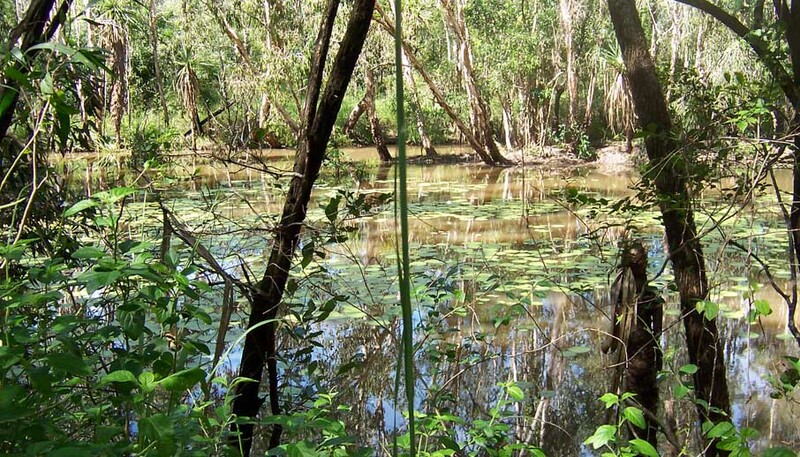 But as I climbed the little mound at the far end of the billabong, where the pond meets the creek, I heard the distinctive groan of a crocodile right before it splashed into the creek. I didn’t see it, I was running too fast in the other direction. But this morning when we went back for another look I did see it, first of all basking on the sunlit bank, then not long after another groan and plunge, it resurfaced in the murky water. With the naked eye it resembled just another piece of floating debris; through the binoculars the curve of its back, a single eye and the tip of its snout came into focus. What was so thrilling about experiencing those creatures together? That I could add two new birds and a crocodile to my block list? That it seemed our creek revegetation efforts were paying off? That they were simply beautiful to behold? That I hadn’t gone looking for this, it was pure serendipity? That they’ve likely been visiting the billabong without my knowledge and that my very presence might well prevent them ever returning? Probably all of these things. Mostly though it was a moment of discovery; an inkling that things were better than I thought.